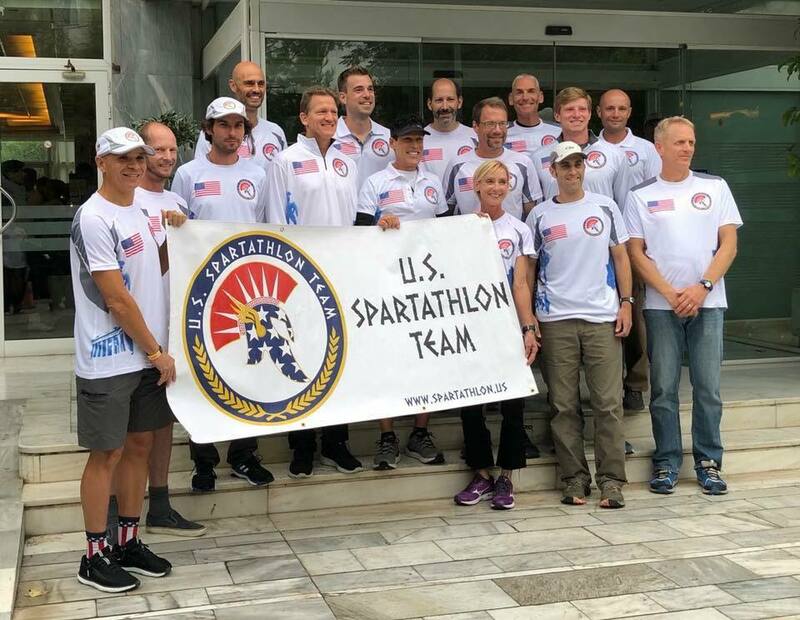 I have successfully returned from my short visit to the wonderful country of Greece, and am still reflecting on my entire experience participating in the Spartathlon race. I wrote in my preview post just how nervous I was going into this run, and as I came to learn over the course of the run, that this nervousness was warranted. 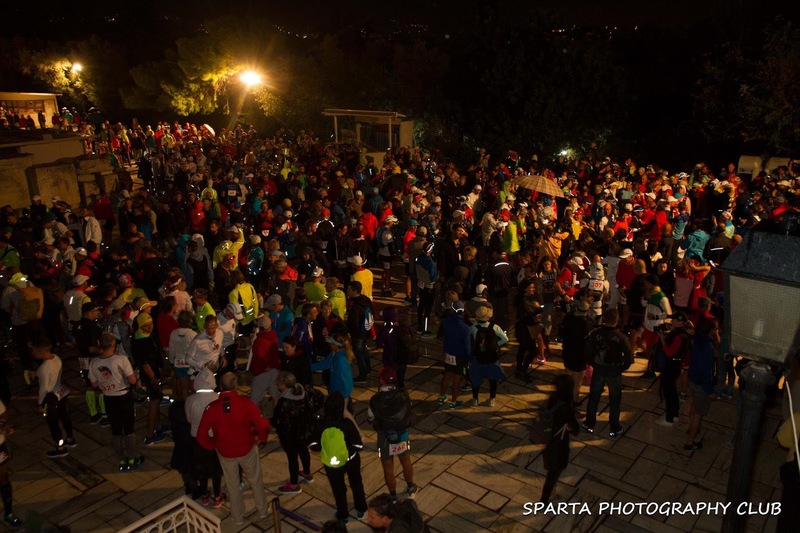 The Spartathlon is a tough race...there's really no other way of saying it. 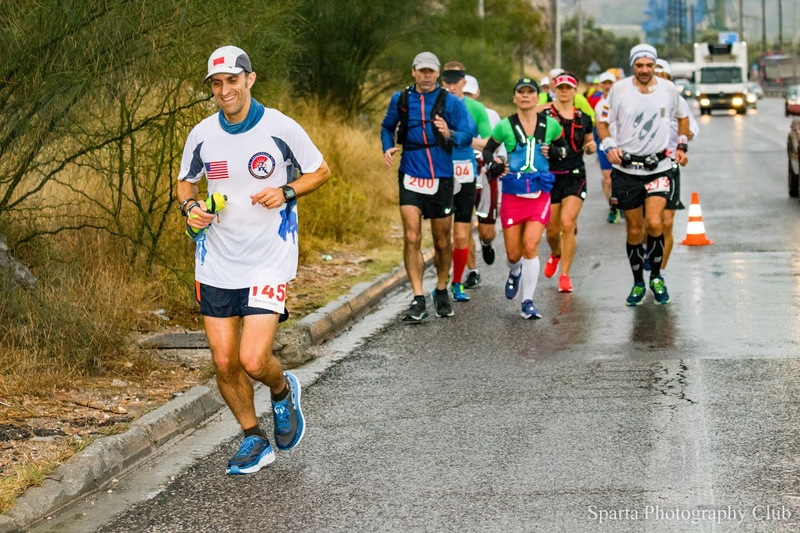 While the terrain is very run-able, the 153 miles of pavement combined with strict time cut-offs, makes the entire endeavor very hard on the body. 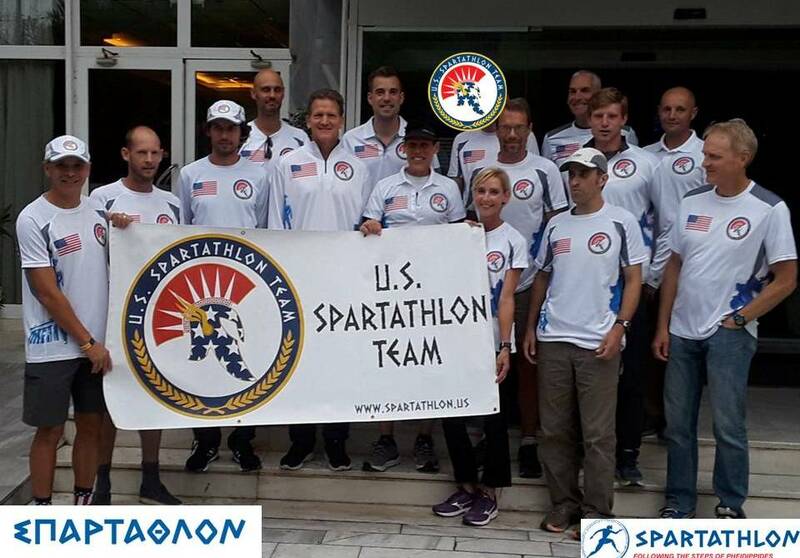 The first thing I'd say about the event, is that door to door, Spartathlon has to be the most affordable event I've ever participated in. It was also the event where I absolutely felt the most pampered and spoiled as a participant. 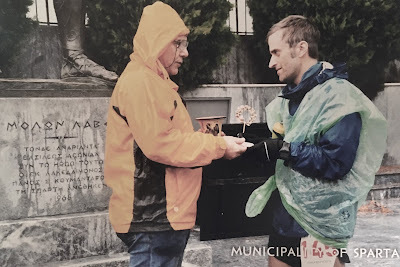 When I was accepted to run, I had to submit a 700 Euro registration fee. This was a bit of a tough pill to swallow, but many friends of mine that have previously run the event were quick to tell me that the overall event is a enormous bargain. This seemed hard to grasp at that time, but now, having gone through it all, I can't stress this enough. That 700 Euro fee literally covers EVERYTHING. It is entirely possible to participate in the entire Spartathlon weekend without spending more than a few dollars on public transportation and possibly a coffee or two. Every meal (3 x per day), every hotel room, and every major bus ride is covered by that fee. And let me tell you, the meals were incredible! I spent a total of 12 Euros on bus rides to and from the airport, and about 10 Euros on a Latte and some snacks my first day in Athens. 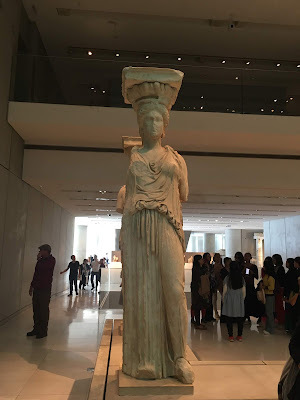 Other than that, the only money I spent was on Souvenirs/Gifts, and on tickets to tour the Acropolis and the associated Museum. 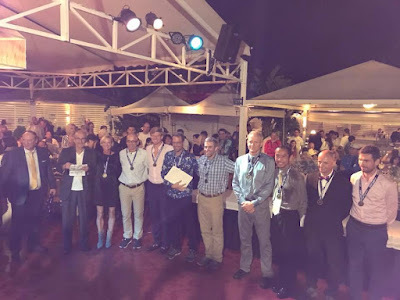 On top of all this, while in Greece as a Spartathlon Athlete, you are treated like royalty. I can't stress this enough. When people learned I was there to run the race, I always received special treatment and was ridiculously pampered. I felt really guilty about this, but the Greeks went out of their way to make the runners feel special. At most ultras, I always do fine managing for myself and dealing with my own gear and supplies. 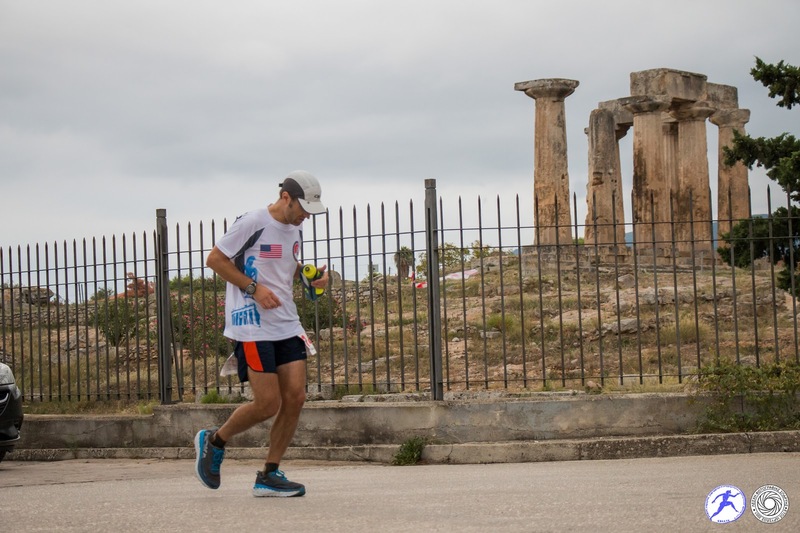 At Spartathlon, the locals get offended if you try to carry your own bags up to your room. It was all very surreal. I found out about a week before leaving for Athens, that of all of my 15 US teammates, I was arriving last. This led to a bit of anxiety, particularly with thought of jetlag. I hadn't realized that Athens was a full 7 hours ahead of Eastern Time Zone, so was definitely stressing about not having enough time to deal with the offset. I wasn't set to arrive until late Wednesday night, with the race starting Friday morning. This basically meant I had one full day to rest and adjust. The flights over went seamlessly, and I transitioned through London Heathrow without issue. When I landed in Athens, I had a small bag scare as it seemed my bag hadn't made it from Boston. Thankfully, it came out at the very end, avoiding what could have been a major issue. I had started to panic that I was actually supposed to re-check my bag in London instead of assuming it was checked all the way to Athens. I had visions of my bag just sitting in London having never been re-checked. Turns out though I was ok, and it was in fact checked all the way through. 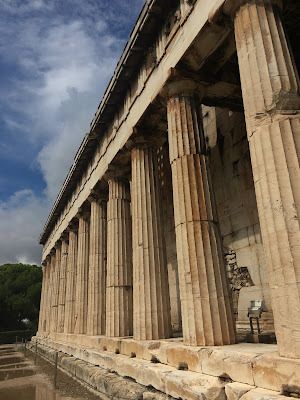 I stepped out of the airport, hopped on the X96 bus, which was very easy to determine from the Athens airport website, and for 6 Euro, got a direct ride to my hotel in the suburb of Glyfada. I arrived just in time to catch the hotel dinner (included), before checking in and heading up to my room. By the time I made my way up to my room I was worried about waking my roommate. To keep costs down, the Spartathlon Association puts teammates together in the same rooms...so I just assumed I had at least one roommate. When I checked in though, the front desk informed me that my roommate hadn't checked in yet. When I got up to the room, I got online and sent him a quick telling him that I was in the room and not to worry about waking me. He quickly responded that he was staying down the street in a room with his wife and so I had the room to myself! Sweet! This was definitely and unexpected surprise. I pulled out and sorted my gear, and did my best to get to sleep. The forecast for race day was still showing rain, but things had become a bit interesting since checking weather before my flight. 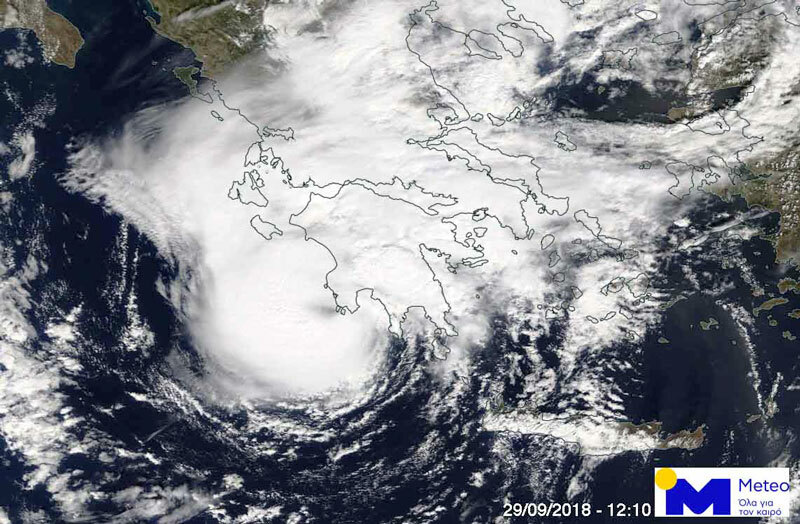 Turns out a Mediterranean cyclone had started brewing off of the coast of Greece and was predicted to make landfall right over Sparta on Saturday. Winds were predicted to be upwards of 60 mph, with potential flood-level rains. Apparently Sparta is known for flash flooding. Nothing I could do about it, so I just made sure to pack a few extra ponchos and some additional rain gear in my drop bags. It sounded like it was going to be a rehash of the Boston Marathon: Rainy, windy, and cold....very different from usual Spartathlon weather that usually is known for very hot, humid, and sunny conditions. I managed to sleep most of the night, and on Thursday my only goal was to check in, and sort my drop bags. I was up early and took a walk down to Glyfada square to get a coffee and snacks. 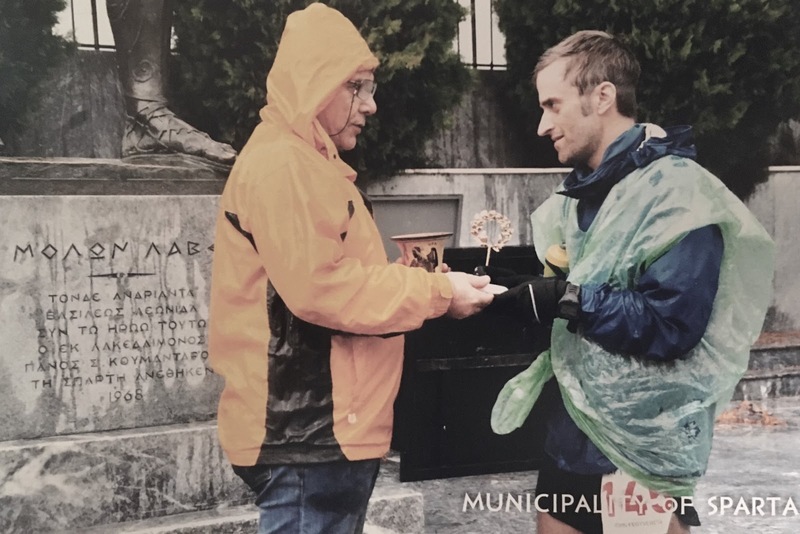 I tested out some of my Greek that I had learned from Dualingo, and managed to fool a few locals into thinking I was fluent. One store owner even told me I had a "good accent". Cool. 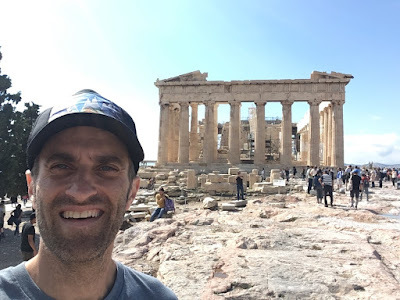 I will say, much like with Quebec/Montreal and French, it seems that if you at least make an effort to try and speak a little Greek, the locals are much more receptive. I sincerely think that they appreciate it when you at least try. I went to check in when I got back to the hotel, and received all of the necessary paperwork, information and of course, bib number. I then spent the next few hours carefully sorting out my drop bags. Originally I had only planned for 4 bags, but after the weather report, I decided to go with 6 just to give myself a few more potential spots for additional warm/dry layers. Turns out this was actually quite crucial to my eventual finish. Regarding gear, this was actually rather strange for me. Normally for an ultra of this length, I'd go with some sort of hydration pack. Spartathlon is very unique however, in that there are aid stations quite literally every 3 miles or less. 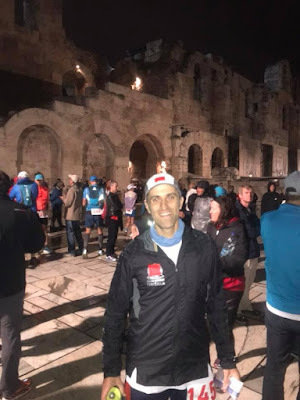 Past US runners that I had been consulting with had told me to go as simple as possible, and to not worry so much about carrying my own nutrition. One friend of mine specifically said, as much as possible I should try to "go native". What he meant was simply to eat the simple cookies/biscuits at the aid stations to fuel, along with the coke and juices. It's entirely possible to get all necessary calories this way. This seemed like a risky strategy, but I ended up essentially going with it. I did opt to carry a few simple sources of calories as back up, and for the first 15 miles (where aid stations just had water), but essentially, all of my fueling came "natively" from the aid station calories. My setup was probably one of the most simple I've ever gone with for a race of this magnitude. Eschewing any of my typical gear, I chose to wear a very simple waist belt that allowed me to have a few stretchy pockets, and then a single handheld bottle. 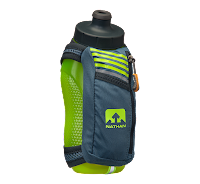 I did pack a small waist-bottle kit in a later drop bag in case I got tired of carrying a hand-held after 100+ miles, but I ended up staying with my starting gear for the entire run. A very small baggie of salt tabs, extra lube, band-aids, and a couple of wet wipes. 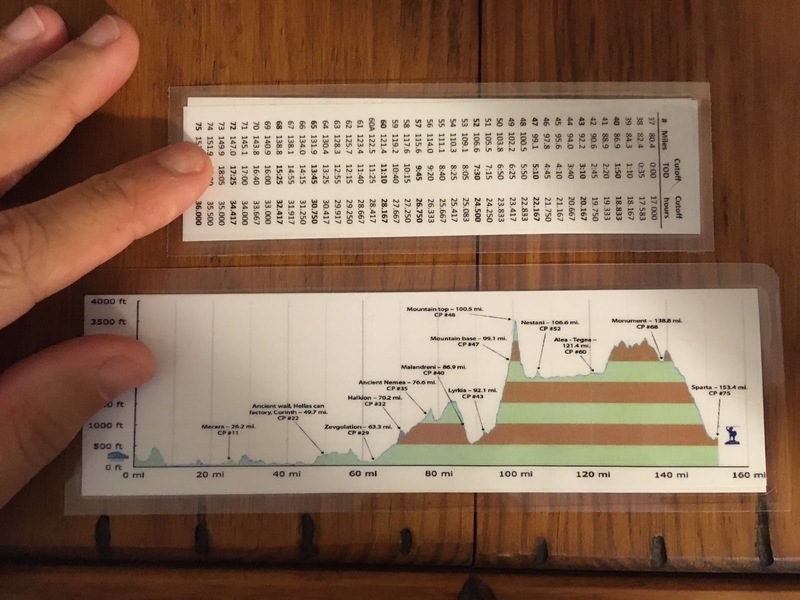 My laminated pace and elevation charts. In my hand-held bottle, I also carried one additional fruit strip in the pouch. Very early on in the race I began wearing the wind shell, so what I was actually carrying in my waist-belt was incredibly minimal. Within a few miles of running, I forgot I was even wearing it. I sat through the mandatory runner briefing in the afternoon, and didn't really learn anything new. They told us some specifics on certain aid stations, and some additional rules for crews. Since I was there alone, most of the briefing was already covered in the runner packet. After about 45 minutes we filed out and the rest of the evening was ours to relax. We took our US team photo shortly after, and then everyone settled in for an early night. The buses would pick us up at 5:45 in the morning to take us to the Acropolis for a 7 am start. I was warned by many that the buses are always running late, so to be ready to hop off and run with very little time for pre-race routines. I made sure to use the bathroom before getting on the bus. We arrived at the Acropolis with just enough time for a quick partial-team photo and a stop by the porta-potties. It wasn't raining yet, but the forecast had rain coming not long after the start. It was very crowded and somewhat chaotic in the starting area. I don't remember much other than simply trying to calm my nerves a bit. 7 o'clock came up very quickly and before long the 10-second countdown began. It was already getting lighter out, but as expected, a light rain drizzle had already started. It was going to be wet. I figured once I made it over 100 miles, my only goal would be to hang on, and finish. If I were able to hit 100 in around 21 hours, I felt that my natural slow-down would put me on pace to finish the entire run in about 34 hours (with a nice 2 hour reserve cushion). This was a nice estimate, but I was not necessarily aiming for it. I sincerely only wanted to finish in the 36 hour time limit. This was especially true considering the weather forecast for Sparta and the greater vicinity around the time I'd be finishing. from 100 on, run as much as possible, but walk if needed, always walking faster than 3 mph. Spend less than 30 seconds at any aid station unless I had a drop bag. My first goal was to hit the marathon mark in under 4:10 (or roughly sub 9:30/mile pace). To me this meant steady and focused running through Athens, with stops of 15 seconds or less at aid stations (and skipping some if possible). The first two stations were water only, and at station 3 I ate my carried gummies. This meant I didn't even stop at an aid station until over 10 miles into the run....saving me some additional time. In the first few miles I ran on and off with various members of the US team, but ultimately stuck to my game plan. I never ran with other team members for too long if their pace was too much greater than my planned pace. In a few instances I caught myself running sub 9-min miles and I had to pump the brakes hard. It is so damn easy to go out too fast at this event. I cannot stress this enough. The early miles are flat and very easy running. Even a moderate 9 min/mile pace feels so damn slow. It was very hard to force myself to not go under 9's. Some might say this was a stupid strategy and I should have run what felt right, but I know this would have only come back to haunt me later. As you'll come to read, my legs and overall body felt great even at 100 miles...it was ultimately a sore/swollen foot that caused me trouble late in the race (but more on that in a bit). Somewhere around the half-marathon mark (Elefsina), I caught up to US team member Andrei Nana. We ended up running together on and off all the way until mile 40. 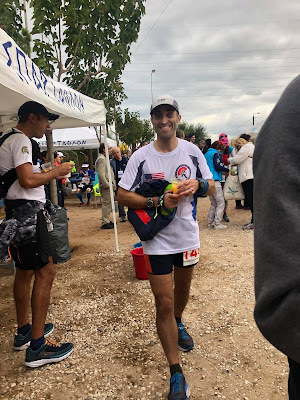 He ended up being great company and being a Spartathlon veteran, he was able to fill me in on course information and great points of interest along the way. Running and chatting along with Andrei really made the early miles go by effortlessly, and we both appeared to be on the same pacing plan. I consistently reminded him to go ahead if I was slowing him down, but even when he would inch ahead, I'd generally catch back up....so we just sort of went with it. These coastal miles went by quickly and the aid stations came one after another. Andrei and I were checking off early miles exactly as I had hoped. A quick pace check had me arriving at the marathon mark right at 4:10, so I was a little nervous that I had gone out perhaps a smidge too conservatively. I chose to pick it up just a bit. Andrei didn't notice, so we continued together. 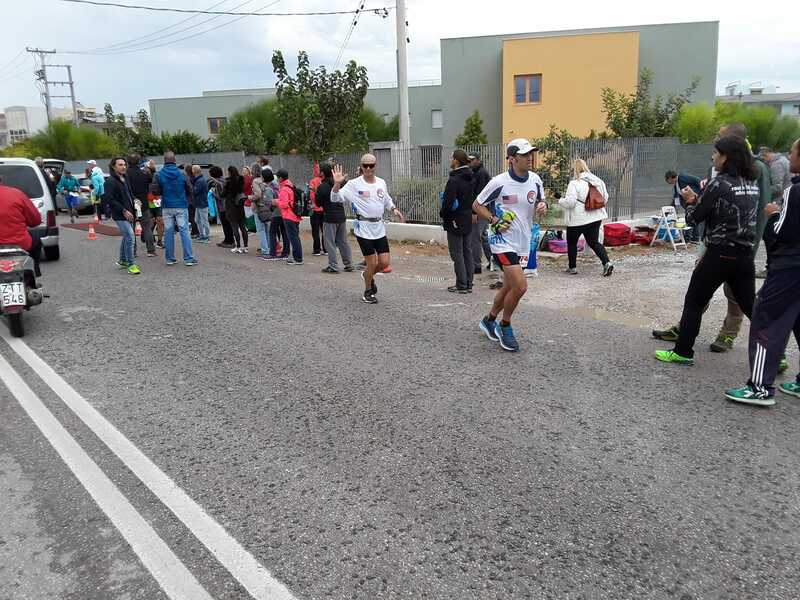 At the Megara aid station, the runners hit the Marathon mark. This is a very well published milestone for the race. I had my own goal of sub 4:10 and as I crossed the mat, my watch recorded 4:08. Perfect. I felt absolutely fantastic, and had no notable fatigue. I was still running completely, and had no urge to walk. My pace had slowed a slight amount, but exactly as I predicted. 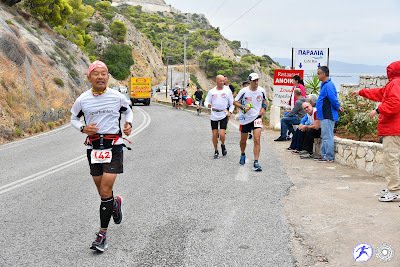 Despite my optimism though, the real first notable time cut off for Spartathlon actually comes at mile 50. This is the cut off that most runners fear and aim to hit...well that and the 100k mark. Once over 50 miles, the pace needed to maintain a finish drops significantly. In order to make the cutoff, runners must hit 50 miles in 9:30 or less. For me, I wanted at least a 45-50 minute time cushion here...so was aiming for about 8:40. I was in and out of Megara quickly while Andrei stopped for aid. I didn't have my first drop bag until mile 50, so wanted to bank as much time as possible in these early miles. I figured Andrei would eventually catch me anyway, which he ultimately did just a few miles later. 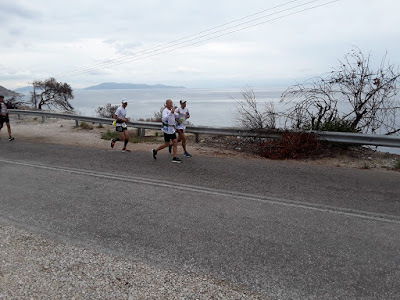 The coast running continued after Megara and the miles kept creeping by. Soon I was at the 50k mark and Andrei was back running with me. We continued to trade stories as the miles went by. I informed him of my intention to start incorporating 2 minute walk breaks at mile 40 and to definitely go on ahead. I was eager for something new, so was treating mile 40 as a big milestone. The course went through the coast town of Kineta, but also went through another large oil refinery. The rains stayed away as the morning slipped into afternoon. Overall, the course was still incredibly flat and/or run-able with only a few small climbs. 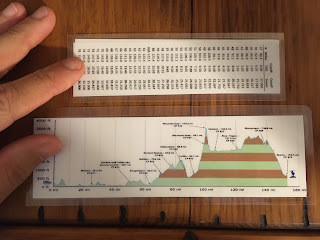 The profile did show a small climb ahead into mile 50, but the first real sustained climb wouldn't start until after the large aid station at Zevgolatio at just over the 100k mark. I had a large drop bag at the stop, which I was also likely to hit not long before nightfall, so this seemed like a good place to take my first real sustained break. With that said, I had my first drop bag at mile 50 and was planning on a short 2-3 minute break there depending on my time cushion. Miles 30-40 went by fairly quickly and in a blur. I remember hitting the 50k mark, and then not soon after thinking that my walking breaks were going to start in just a couple miles. At mile 40.5, I hit an aid station and began my 2-minute speed walking breaks upon leaving. I noted that even walking, I was moving at 15 min/mile pace (4 mph). I had practiced walking fast a lot in the weeks and months leading up to the race, and I could tell it was paying off. Despite my 2-min walking breaks, I managed to stay on-and-off with Andrei all the way into Corinth and the large canal bridge. 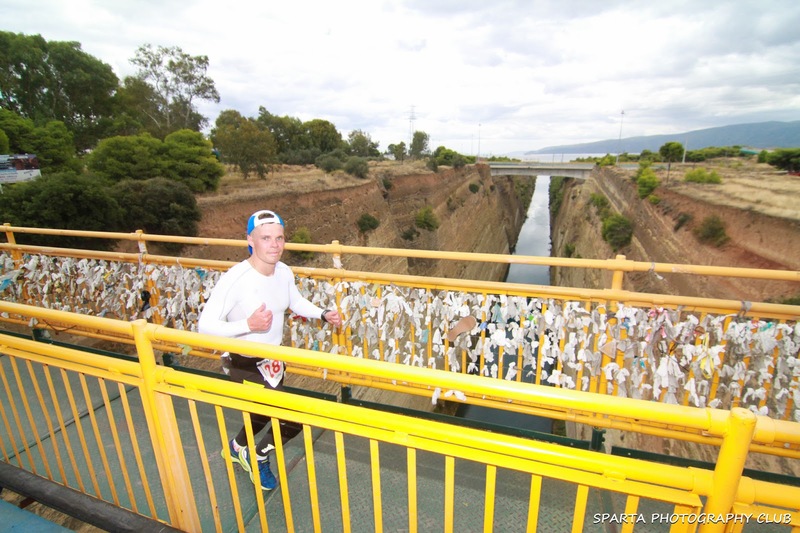 The pedestrian bridge over the enormous canal is an significant milestone in the race, and marks the point where the scenery begins to change drastically. It also marks the first really big time cutoff as it's just before the 50-mile aid station. When I made it to the 50-mile station (49.7), I was ecstatic upon checking my splits. My watch read 8:20, putting me a full 70 minutes ahead of the cut off. I was actually slightly concerned that I was pushing too hard, but figured if I was on that pace, even with my walking breaks, that I was still ok. I took an extra few minutes at the station to rest and eat some hot soup/noodles. A friend snapped a photo of me, and I have a goofy/stupid grin on my face...very pleased with my effort so far. I was still not feeling fatigued yet, and ready to start some of the more beautiful miles, and enjoy the late afternoon. At this point, it was still only 3:30 PM and I had hours to go before night fall. My headlamp and warm gear were waiting for me at mile 63. Other than swapping out some drink mixes and fruit strips, I did not change out any clothing at mile 50 and gave my drop bag back rather quickly. Happily 70 minutes ahead of the cutoff, with drop bag in hand. Andrei left well before me, so I had assumed I wouldn't see him again. I had roughly 13 miles to get to the 100k mark and my big drop bag in Zevgolatio. I was planning a substantial stop there to reassess clothing, get my headlamp setup, and take in a few extra warm calories. I continued on as usual, also knowing that these 13 miles would be the last "easy" miles. Upon leaving the station at 63, I would have my first real sustained climb. My 8/2's were still working well, but I was starting to sense the slightest hint of fatigue coming on. 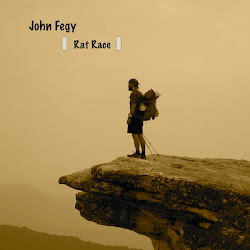 I was hoping I wouldn't really notice any fatigue until at least the half-way point, so this had me a little concerned. 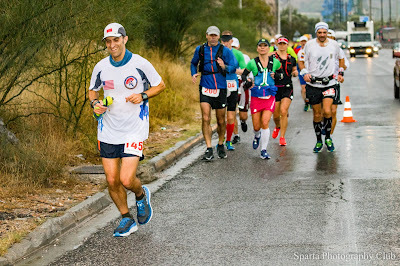 Deep down, I knew that I probably hadn't trained with the volume of miles I really needed to run Spartathlon without issue. I was sort of expecting the final 20-30 miles to be a struggle, but I was worried that I was already feeling some fatigue at nearing mile 60. Somewhere around mile 55 or so. The daylight hours began to fade, and after running through some beautiful country, spotted with old ruins, I finally came up on Zevgolatio and my primary drop bag. I hit the 100k mark right at 11 hours, so only about 15 minutes ahead of my planned pace. I had definitely slowed a bit...but was actually now almost 90 minutes ahead of the cut offs. Fantastic! 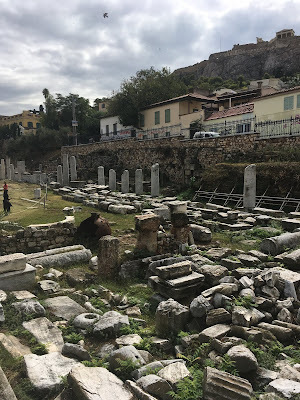 Somewhere in this stretch, while running through one of the neighborhoods of old Corinth, dozens of local children came out onto the streets to ask the runners for autographs. It was a bit surreal, but I stopped several times to sign small notebooks. Several runners asked me my name as well. 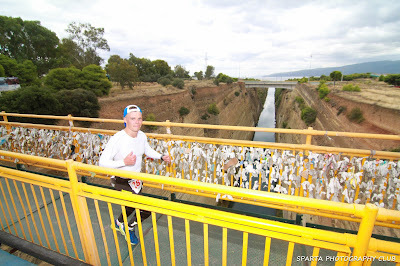 One of the other runners I was near, told the children, "Today, we are all Pheidippides"!. What a perfect response. I arrived at the aid station right around 6pm, and I immediately grabbed my bag and sat down on the curb to sort through it. I had some snacks from the aid station, but was more concerned about assessing my clothing choices before starting into the night. The forecast had more rain and cold temps headed my way. I changed my shirt, grabbed my rain coat, and put on my headlamp. I sorted some some other gear around but left after about a 5-7 minute break. Not long after leaving I was switching on my headlamp as I began the 1000+ foot slow climb up rolling country roads. It was sometime around sunset that the rains returned...and they were definitely cold. I was regretting not grabbing my cheap poncho at my previous drop bag, thinking my rain coat would be enough. Despite it's Gore-Tex fabric, it was not keeping me very dry, and I was staring to worry a bit about the temps. The dirt roads were also getting quite saturated, and at many places along the course I was forced to trudge through ankle deep mud puddles. Still, I was having a blast and was sincerely enjoying the rolling dirt roads so much more than the paved city roads of earlier on. My next big drop bag stops would be at miles 76 and miles 92. These gave me very bite-sized and tangible goals to aim for after leaving mile 63. I would have a 13 mile section, and then a 16 mile section. The slow climb up to ancient Nimea (Mile 76) actually kept me warmer, as I was notably working a bit harder. In this stretch I also slipped a bit on pace and started working in 7/3's perhaps a smidge before I had originally planned. Still, I was well within my overall planned pace and was now roughly 2 hours up on the time cut-offs...and still gaining. These early evening miles went by a bit slow. 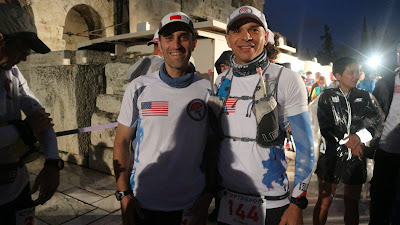 At one point I came up on a familiar face in the dark...my fellow US team member and well known runner Dean Karnazes. We spoke a bit and it didn't take long to realize that he was not really in a good place mentally. Eventually he pulled ahead of me and I was content to fall back into a nice little isolated pocket. I should note that only now was I noticing large gaps in the runners. For the first time, I truly felt like I was out on the course alone. I could see a faint head lamp or two way ahead of me, and maybe one at a distance behind me, but for the most part we were all moving about the same speed....meaning I was in my own little place along the course. I did notice I was starting to get rather chilled, so upon arriving at my next drop bag, I not only grabbed my hat and gloves, but I took a spare garbage bag from the aid station (with permission of course). It was definitely rather ghetto...but it did the trick as a makeshift poncho and kept me notably warmer as the rains continued to fall. I managed to keep fueling sufficiently on coke, biscuits, cookies, chocolates, and my energy drink. I still wasn't feeling aerobically tired yet, but my legs were definitely starting to get a bit heavy. I kept on plugging along into the night and eventually made it to my next drop bag at mile 92 in Lyrkia. This was a critical point in the race as it marks the start of the infamous "mountain climb". When leaving Lyrkia, the runners can clearly see the long ascent that will be made up the subsequent road switchbacks. It's one of the few times that you can clearly see ahead to a what you will have to do along the course. The road climbs about 2000 feet over roughly 7 miles until it terminates at the final trailhead for the last 1000 feet of climb up to the mountain summit. 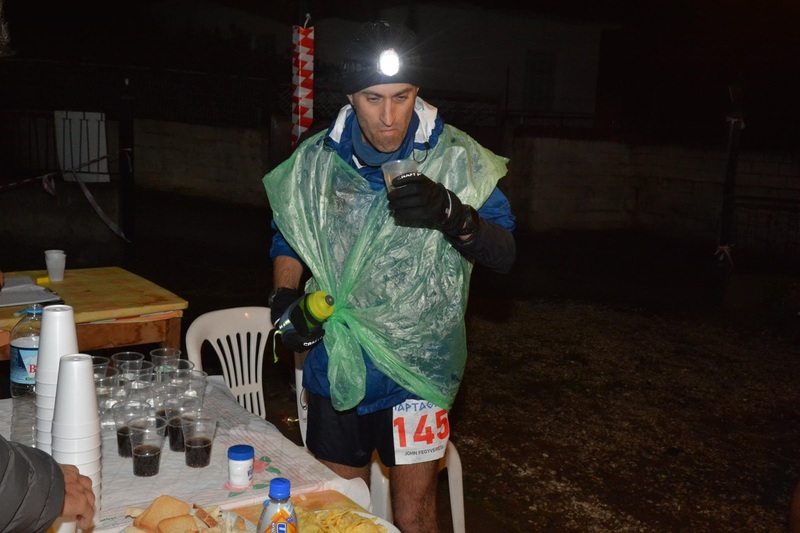 Word at the aid station in Lyrkia was that it was a whopping 3C at the summit (~37F)....yikes. I was preparing myself for some cold temps. Thankfully I'd be climbing hard and would hopefully have an elevated heart rate to keep me a little warmer. The rains had let up a bit as well, but it was still really damp and foggy....and nothing was dry. The road climb went by fairly quickly and I was pleased that I was able to maintain 16 minute miles over this climb. For as steep as the road bits were, this to me was a huge success. Obviously, with such a sustained climb, I wasn't really doing my 7/3's...and was simply just power walking everything. I passed a few aid stations along the climb, but eventually did make it to the base of the final trail section right at mile 99. I topped up at the aid station there, and was told it was a little over a mile to the summit, with about 1000 feet of gain. This was definitely the steepest, and most technical part of the entire course. It was as single track trail, made more tricky by the slick rain and mud. I put my head down, put my hands on my thighs and started pushing out a strong climb. I caught up to and passed several runners in this stretch with my strong climbing, including fellow US team member Elaine Stypula. Elaine would end up passing me later on and finishing with an incredible sub 34 hr time. For now though, I managed to push out a very confident climb and hit the summit in no time. It was ridiculously cold at the top...close to freezing, and completely socked in with misty fog. Major props to the aid station volunteer who were sitting at the top, but I wanted nothing to do with that station, and only wanted to push on and get down in elevation to the next major check point: the village of Sagas two miles down the course. I was a little nervous about the remainder of the elevation profile as the remaining 53+ miles of the course would essentially all be above 2500 feet. This mean that it would be notably colder, and with the expected arrival of the big storm, I was starting to worry considerably about how I would fare with my thermal regulation. Normally I love the wee hours of a 100+ mile race, but in this case, I couldn't wait for the sun to come up and bring the temps up a bit. When I arrived down in Sagas, I actually took some time to warm up at the aid station. Perhaps this wasn't the best idea, but at the time, I could think of nothing better than getting some hot coffee and soup into me. Ultimately I do think it helped a bit. It was somewhere at this point that I was also starting to notice a hint of nagging pain in my left foot. I left the station on my 7/3's...but slipped back rather quickly to 6/4's. I hit a major aid station in Nastani and my 2nd-to-last drop bag. I again took a longer break here, and made sure to warm up with some soup. I was definitely losing time to the breaks, but I was ok with it. Thinking back to my original plan, once over 100, my only goal was to "hang on". I still felt ok, albeit cold...but my foot was starting to hurt more, making it notably harder to run on. When I left Nestani, the course proceeds for about 15 miles in what I can only describe as a rather boring stretch. It's hard to explain, but the terrain is excruciatingly flat, with almost no discernible scenery, along a very straight stretch of roads. In addition, I was on this stretch in the hours not long before sunrise when I was most tired. Occasionally there would be a bend or turn in the road, but for the most part I found this the to be one of the most difficult stretches on the course. I was completely alone, and the miles were going by incredibly slowly. It was in this stretch where I had wished I was allowed to have some music to listen to. Thankfully, the rains had let up, so at least I wasn't doing this section in a downpour. The sun eventually did come up along this stretch, and when I finally made it to Alea-Tagea at mile 121, in what seemed like an eternity, it was the last time I really felt ok and was able to run. Over the course of the few hours in this stretch, my left foot had become incredibly painful, and I was very limited in how much running I could do. I swapped out some gear in my last drop bag, and thought ahead to the fact that I still had a 50k remaining. At this major checkpoint, I had lost about 20 minutes of time cushion as well, and was now only about 1:55 ahead of the cutoff. This certainly caught my attention, but I wasn't panicking yet. Very quick math revealed that even with walking alone, as long as I maintained about a 3.2 mph pace, I'd finish within the 36 hour time limit. This is roughly a 17-18 minute mile. Something I should note here. I've had several people ask me how my Garmin was able to capture the entire race on one charge. The answer is that it wasn't. I very cleverly grabbed a lipstick style USB battery charge in my 76 mile drop bag along with my Garmin charging cable. Then once my watch gave a low battery warning, I ran the cable down my coat sleeve to my watch and tucked the battery charger in my waist belt. I managed to fully charge my watch two different times and thereby capture the entirety of my race this way (strava track). I honestly don't remember much about miles 121 to 140 other than the were slow. This was definitely the lowest point mentally for me in the entire race. I was frustrated by the fact that I couldn't really run, and annoyed that because of it, I was getting progressively colder and losing time. People were consistently passing me in this stretch. I mostly put my head down and made it a game of "just make it to the next aid station". This stretch of the course is also quite high in elevation, making it very cold. 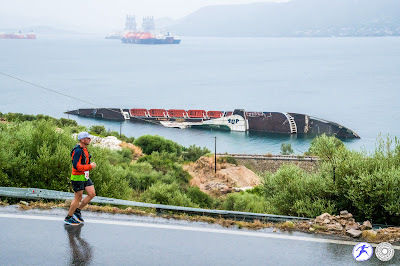 In addition, somewhere around mile 135, the Mediterranean cyclone, appropriately named "Zorba", had started to rear its ugly head. Winds picked up notably, and the rains started coming in sideways. Nothing too ridiculous (yet), but enough to sour the mood a bit. As I said, this stretch was incredibly tough mentally, and all I thought of was progressing to the next aid station...one at a time. Every station I arrived at, I noted the cut off times, and I was progressively losing between 5-10 minutes each time. This was not good. At mile 138, which I hit roughly 31 hours into the race (only about 1:15 ahead of the cutoff), I began what would be the last significant climb of the course. I was completely walking at this point with only a few short little running efforts which never lasted more than a minute or two. My left foot had become nearly impossible to run on, and I was actually starting to worry that I may have incurred a stress fracture. I was quite literally starting to visibly limp. Just 15 miles more was all I had to suffer through....how much worse could it really get right? When I topped out on the last climb of the course at mile 140, I was greeted with ferocious winds and rain. The kind of wind that literally pushes you off your feet..especially when you are wearing what is effectively a large sail. I was getting blown all over the place in what was easily 50-60 mph winds. The rain was blowing so hard that it was truly coming in sideways and the water on the ground was flowing up hill. Add all of this to the fact that I was still up over 2500 feet, and I began to visibly and audibly shiver....badly. I could tell my core temp was way down and I had no more layers to put on. All I could do was suffer my way through the last 13 miles. The wrath of Zorba the Greek....was in full effect. Aid stations were shutting down because they were literally get blown over. Ambulance crews were riding along the course and began picking up runners that were having trouble. This was a really bad scene and all I wanted to was to drop in elevation....to get out of the wind shear zones. I figured once below 1500 feet, and off the mountain tops, It'd be a little more bearable. The problem was, that despite the apparent steepness on the elevation profile, the actual descent was spread out over the last 10 miles. This meant it would be at least 5 miles of walking before I'd really be out of the horrible winds. As I descended slowly, passing shut-down aid stations, and shivering uncontrollably, I noticed massive trees that had blown down, huge outcrops that had shed large boulders, and what appeared to be signs of flash flooding all down the mountain. This was really starting to get dangerous. 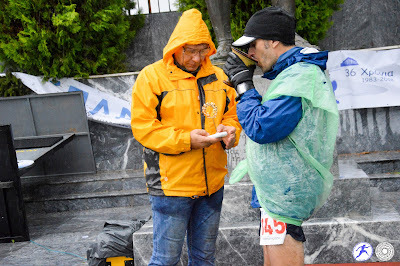 I didn't realize it at the time, but apparently the Spartathlon committee had actually extended the overall race time limit past 36 hours due to the conditions...but that word never reached us runners in the last 10 miles. For me, I was still under the impression that only a sub-36 would be official. Every mile I just kept getting colder and I still couldn't run on my bum foot. It was actually getting worse. At around mile 145, I did the math and finally felt like pending a major problem, that I was going to be able to walk-it-in, and still finish sub-36. I felt a bit disappointed by the prospect of going out with a whimper, especially after such a successful first 100 miles, but I told myself over and over again that my only goal was to finish. At mile 147, I hit the town just up hill from Sparta, called Voutianoi. This was the 10k-to-go mark and was a big mental boost. I was in and out of the aid station as they had nothing hot, and continued to limp down the road. 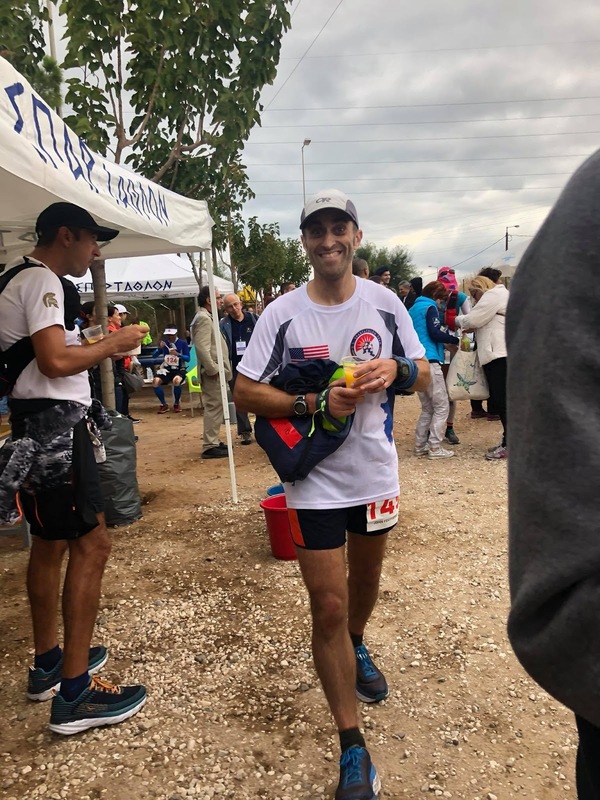 Three short miles later, at mile 150, I passed through the last village before Sparta, Kladas, and was told there was just two aid stations left, and 5.5 km to the finish line. Specifcially, it would be 3 km to aid station 74, and then 2.5 km to the finish. These were such manageable little chunks that I eagerly picked up my hiking pace. I started to have a bit of a glow on my face as I knew I was within reach now. The scenery was getting notably more "urban" as I entered the outskirts of Sparta. I crossed the Eurotas river which was absolutely raging above flood stage. The entire city was essentially flooded. I didn't care. I was plowing through ankle deep puddles with no regard or care whatsoever. When I hit the last aid station, number 74, it had already been torn down. I didn't even care. I had 2.5 km, or 1.5 miles to go at this point...nothing was going to stop me. My watch read 35:06 total time. I would have 54 minutes to cover 1.5 miles. This was really the first time I knew for certain I would finish. For the last mile the course takes you around an inner city block of Sparta before the long straightaway to the King Leonidas statue at the finish. As I walked along this stretch, locals all along the way began cheering for me as loud as they could. It brought tears to my eyes. 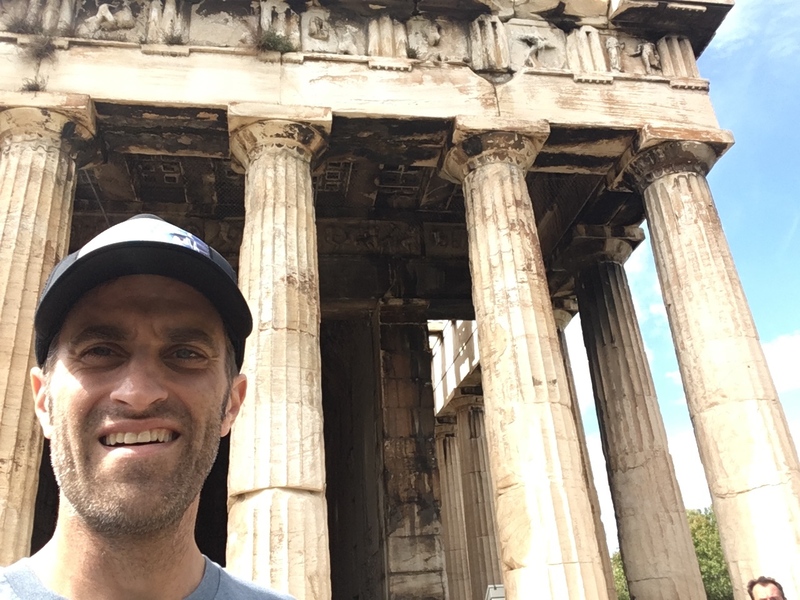 I felt like a true messenger that had just made the actual journey from Athens to bring word to the Spartans. It was surreal. 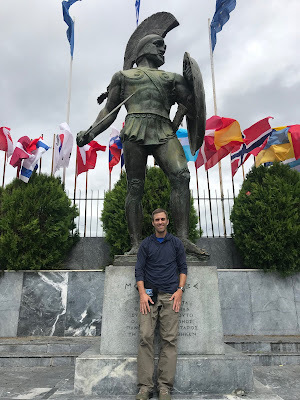 When I rounded the last turn onto the street lined with the all of the international flags, I could see the Leonidas statue about 1/2 mile away. Somehow, despite the overwhelming pain, I managed to pick up a feeble jog, and ran that last half mile down the road, up the steps and to the foot of Leonidas. I rested my head upon his foot, kissed it as is tradition, and finally took the long overdue deep breath. My final time was 35:33. I had lost over 90 minutes in the last 25 miles of the race due to my walking (At mile 115 I was on pace to finish just under 34 hours). My goal of finishing this event was met. I knew it would be a tough one for me, and I was pleased the my training got me through the first 100 exactly as planned. I took a drink from the ceremonial cup offered to me by the race official, and headed immediately over to the medical tent. I was stripped of my wet clothing, given a dry finishers shirt and trophy, and eventually put in the shuttle bus to head back to the hotel. I was utterly spent and fell asleep almost immediately in the shuttle. I woke as we arrived at our hotel and had a lot of trouble getting out of the van. I hobbled my way into the lobby, checked in, and was crashed out on the bed within minutes. I had the wherewithal to set my alarm thankfully, so didn't oversleep the next morning for the bus ride back to Athens. The next few days were a blur. We were shuttled out of Sparta to a lunch hosted by the mayor. Then, we were bussed back to Athens, arriving about 8 pm at night. The next morning we had some free time and I managed to spend a few hours down at the Acropolis touring some of the ancient temples and structures. 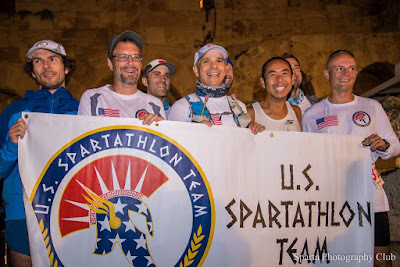 Then, as a final blowout, The Spartathlon association throws an enormous celebration party Monday for all of the runners, presenting our finishing awards, certificates, and medals. The entire experience was mind-blowingly elaborate. The US team went up as a group and we all received our awards together. I felt a real sense of pride at that moment. We had 15 runners for team USA, and 11 managed to finish within the 36 hour time limit. First off, I can't stress this enough. Everything about this entire experience was incredible. I have never felt so pampered and spoiled at a race. I still can't believe how much our registration fee managed to cover. 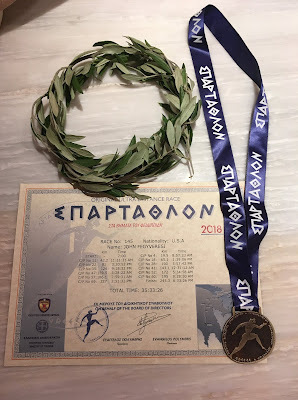 Second, despite the inclement weather, and the problems with my foot, I wouldn't trade my Spartathlon experience for anything. I came away with some absolutely incredible memories. I absolutely would go back to run it again if invited. Being a part of, and representing my national team, was something I've never experienced before. It was very humbling and gave me an additional sense of purpose for making that finish line. I am so very grateful that I was invited. I thank all of my teammates for making me feel so welcome. I would also personally thank both Rob Youngren and Bob Hearn for all of their helpful data and info regarding race logistics, and pacing information. All of the data I received was invaluable and definitely helped contribute to my successful finish. Greece is an absolutely beautiful country, with wonderful people. I hope to one day return for a proper vacation and experience it a little bit slower. Running past ruins that were built over 2000 years ago really makes one appreciate the ridiculously fleeting nature of our own human lifespans. I will probably add more details and photos to this as I remember them or they become available. Zorba making landfall just west of Sparta. Video clip taken near the finish line just before my finish.